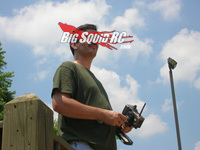 SPECIAL Cub Report- 11.30.2011, Version: Traxxas XO-1 “Supercar” « Big Squid RC – RC Car and Truck News, Reviews, Videos, and More! Yes, the most highly anticipated release of the year, the Traxxas XO-1, has officially been unleashed on the public. So what’s the buzz? First off I was a bit startled by the shear amount of rabid hate going around the net on the XO-1. There are a lot of Traxxas fan boys out there, and the car obviously looks crazy uber, so why all the hate? Because- Traxxas has alienated their core audience with this one. The price point is very high, well beyond what their core supporters are ever going to spend on an rc car. It’s pretty easy to hide the fact you spent 200-400 bucks from the wife, but you spend a grand on an rc and she IS going to find out. And that’s if you’ve got the extra grand laying around to spend to start with. The price point alone limits the potential sales of this car. If I was Traxxas and kick’n everyones azz, and if I were sitting around a big table with all my suits and asked the question “If money were no object what would you build?”, the XO-1 would be the result. It’s big, it’s ridiculously fast, and it hits areas of tech that no other rc chassis manufacture has gone to yet. I’m quite certain the XO-1 will go down in history as one of the baddest azz cars ever built. Unfortunately it may go down as the car that alienated all the long time Traxxas faithful. Is the Traxxas XO-1 as “revolutionary” as Traxxas claimed it would be? Not one person around the office said that it hits “revolutionary” status, but… it just may be. If it can honestly do 100 mph out of the box that is indeed revolutionary. It looks like it has a shot at putting up big numbers- it has lots of aero work, more than enough horsepower, and a large footprint to aid in stability, so a 100 just might be possible with this car. But I think it might be more revolutionary in another way- it’s a definitive “baddest azz rc car in the world” that the mainstream can easily point a finger at. It’s from a reputable name, it has a huge price point, and it’s way over powered, that’s something the mainstream can sink their teeth into. I can see this car being featured everywhere from MotorTrend to Engadget. The XO-1 may turn out to be one of the best ambassadors our sport has ever had (if too many legs don’t get broken first!). I do have to give props to Traxxas on this one, I mean the legal team at any sane company would have killed this project early in the design process. The fact Traxxas is selling a 10 lb, 27 inch long rc car with 6S Lithium that can do over 100 mph to any kid with the cash is a statement to their zeal for the hobby and even I can admire that. Support your local hobby shops, tracks and bash spots!